Senate Majority Leader Mitch McConnell held firm on his staunch opposition to any movement on confirming a Supreme Court nominee. In an appearance on ABC's "This Week" days after President Obama selected Merrick Garland as his Supreme Court pick, McConnell maintained that the Senate will not move forward until after the November elections. "The American people are in the middle of choosing who the next president is going to be," McConnell said. "That next president ought to have this appointment." The new comments come as some cracks seem to appear in the Republican firewall, with a handful of senators breaking rank and offering to at least meet with Garland, filling the seat left by Justice Antonin Scalia, who passed away last month. Among the Republicans breaking ranks with the majority leader are Illinois Sen. Mark Kirk, who's in a tight race for reelection. On Friday, Kirk said that Senate Republicans should "man up and vote" on Garland's nomination. Still, McConnell is confident he can hold Republicans together. "Most of my members are comfortable with letting the American People make this decision be electing the next president who will fill this vacancy next year," he said. That could very well be current Republican front-runner Donald Trump, though, who has come under fire for not condemning violence between his supporters and protesters at his rallies, but the majority leader stopped short of criticizing the billionaire business man directly. 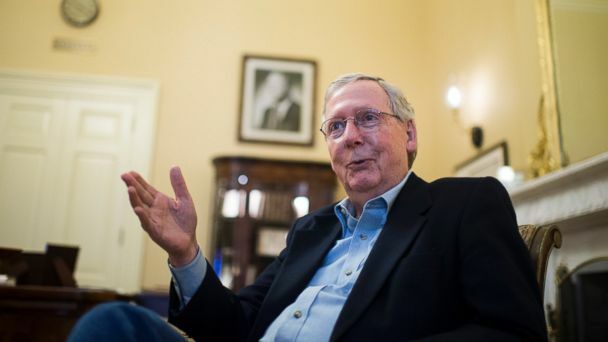 "I think all of the candidates for president ought to be discouraging that kind of activity," McConnell said. When asked if Donald Trump hurt or helped Republican Senators facing competitive re-election bids, McConnell said, "We're going to be running these Senate races no matter who the nominee is."